I shopped for a new mic case recently, compared many of the different ones on the market, and settled on the SKB 3I-2011-MC12 iSeries, a waterproof 12-drop case with a nice amount of extra storage space. The main criteria that I was shopping for were sturdiness, affordability, room for a comfortable number of mics for what I do (live sound on small stages), and enough extra storage space for cables, windscreens, and other odds and ends like adapters and my decibel meter (more on that later). 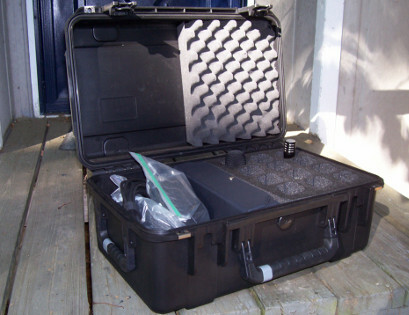 I didn't want a case that would be so bulky that it would be a problem fitting it into our already-overladen truck along with the rest of the equipment, so efficiency was also important. For first impressions, I was pleasantly surprised when the case arrived, to find that it has two handles, not one. Pictures online only showed one, so I guess the second handle is a recent addition to the model. The second handle is located on the left side, and is correspondingly smaller than the handle on the front. I have found it to be very convenient. I haven't used this case very much yet, but its construction feels very solid, and the plastic that it's made of seems of a quality that will hold up for years and years. I don't have previous experience with latches of the type found on this case, so only time and use will tell how they hold up. I expect them to be up to the high standards that SKB has set with all of their other products. If they do wear out, they are replaceable, and the case also carries a lifetime warranty. My one reservation with this case is its height: it closes quite snugly on some of my longer microphones. The mic drops are about 15.5cm deep, and the top lid is about 5cm deep, filled with a compressible but dense eggcrate foam. That's about 20.5cm total for microphone plus foam, which I emphasize, is of a high quality, dense type. A Sennheiser e835 (vocal mic) is about 18cm long; a Shure PG81 (instrument mic, condenser) is about 19cm long; a Shure Beta 87A (vocal mic, condenser) (not pictured) is also about 19cm long; a Sennheiser MD735 (vocal mic) is just under 20cm long. The MD735 is really pushing it for this case, but luckily, that mic does not belong to me, and usually lives in another case. 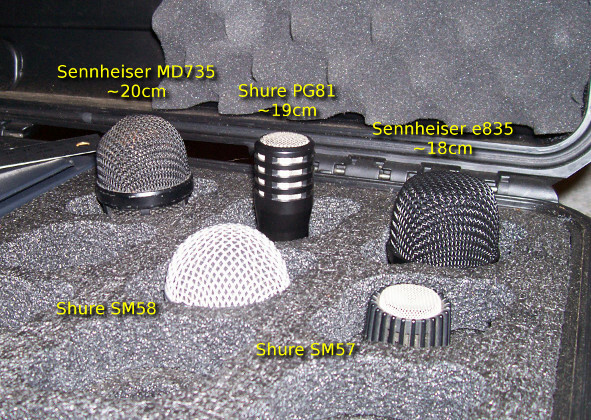 With each of these longer microphones, to varying degrees, while the lid does close completely, you can feel the tension caused by the compression of the foam. I don't think any damage is being done to mics or case, but a mic held too tightly could get damaged by an unlucky impact to the case, so extra care must be taken. It would help if the case were just one or two centimeters taller. Extra storage space was an important criterium for me. I specifically wanted a case that would fit my decibel meter. The decibel meter is in a box 11.25 inches long. The advertised interior width of this case is 11.44 inches, so all looked well. However I did end up having to wedge the decibel meter box in, slightly deforming its corners, because what SKB's site does not say is that the sides of the case are slightly tapered. The 11.44 inch dimension is the dimension at the rim. The dimension at the bottom is about 11 inches. I was not at all averse to deforming this particular box a tiny bit to fit it into this case, but other shoppers looking for particular dimensions in a storage area will want to take the tapering of the sides into consideration. In summary, this case rocks, but it could stand to be one to two centimeters taller, in order to accomodate longer microphones. It is made of quality materials and has a solid construction, and I look forward to years and years of reliable use.